You can transform your customers' experience with incident management by simply integrating troubleshooting and knowledge right into your service portal. Your competitors probably aren't doing it yet. So what are you waiting for? It's easy to bring true self-service to users if you're using modern service portal technology. But many organizations—probably including your competitors—continue to deliver context-sensitive knowledge to people who log an incident through their portal—and, sadly, provide little else. Set your self apart by shifting left: Use the latest service portal capabilities to drive customers to solutions, whether they use the knowledge you provide or not. Another plus is you can provide a more descriptive incident to IT. Here's how to get to true IT self-service. One aspect of the shift-left movement is driving resolution from the tier-one service desk to the "tier-zero" level, more commonly known as self-service. Most portals provide only one more channel through which the user can request support. But self-service is about more than the ability for the user to log a ticket; it refers to the ability for users to fix their own problems or fulfill their own needs without engaging with a provider. Figure 1. 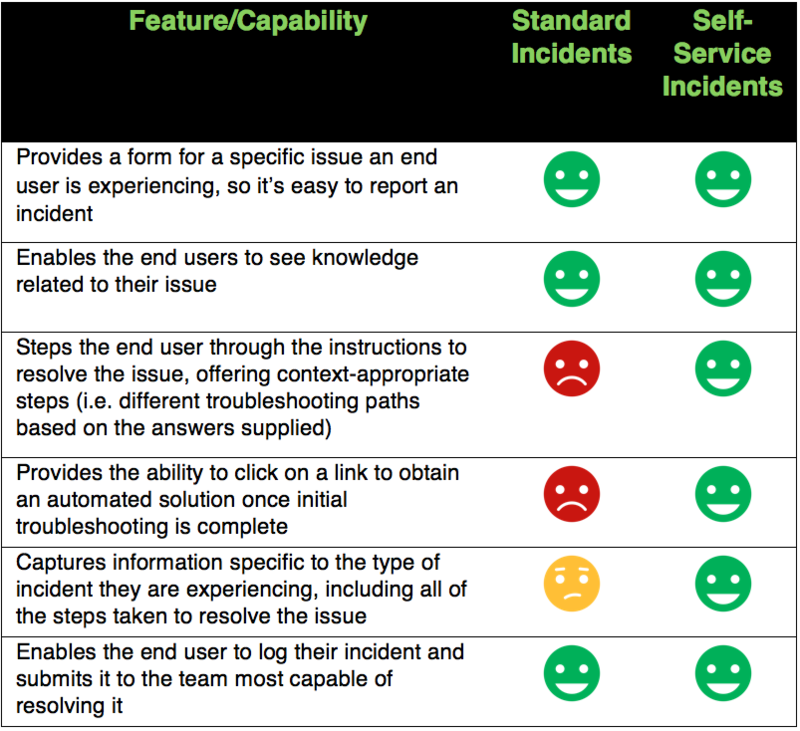 How true self-service incidents compare to standard incidents from a features and capabilities perspective. True self-service starts with an understanding of the user's journey. Use your knowledge of users' needs to write a script for your service portal application in the form of conditional questions, instructions, video clips, and automated solutions. Create a knowledge article about how to resolve a particular incident. Break down the knowledge into steps. Each step should include a decision point for navigating to the next set of steps. Key stakeholders should work with customers to evaluate their responses to questions and work through all of the potential scenarios that could occur. Address each and incorporate it into each journey. Use tools that can run videos and automated scripts. Step 1: It's daunting to take on the entire universe of support in one gulp, so start by focusing on the top five or ten issues that the service desk handles. You can expand this over time with agile-style development techniques. Step 2: Develop journey maps using the knowledge articles you create. These start with the steps needed to perform a task or troubleshoot a problem. The continuing process depends on each answer and leverages conditional questions to step users through their journeys until the issues are resolved or an incident is submitted. Step 3: Once the journey maps are complete, translate them into an incident form within the application. Use embedded graphics and videos to help users with any complex steps. Where a utility is needed, use scripting so that the user can run the utility—for example, executing a spyware cleaner at an appropriate time to help with slowness. When it's necessary to log an incident, submit all of the information captured during the process as text in a description field (or variables on the form, depending on the tool). First, you'll save money. The cost of self-resolution is about $2 per instance versus $22 at a Level 1 service desk or $62 at the desktop support level, according to estimates provided by MetricNet. Second, your efforts to instrument true self-service are the first step toward using chatbots to resolve problems through a service portal. And if you already know how to create digital experiences and journey mapping, you can take this information and translate knowledge articles into self-service incident forms to enable true self-service, or self-resolution. Want to learn more and see a demonstration of the entire process for a sample support request? Come see my presentation, "Shift Left: Transform Incident Management with Self-Resolution," at the Fusion18 conference in St. Louis. The conference runs from September 30 to October 3, 2018. TechBeacon readers receive a $200 discount by registering with promo code TECH18.